Start by cutting the pipe wrap to length. 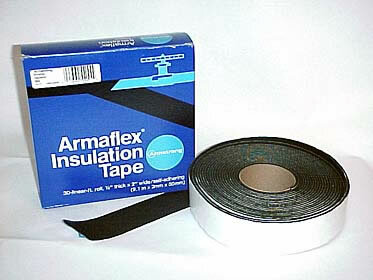 Because the Armaflex tape is 1/8" thick, you'll need twice as many lengths for the 2" wide treads as the number of treads you want to end up with. For each 1" tread, you'll slit a 2" tread in half, so figure this accordingly. 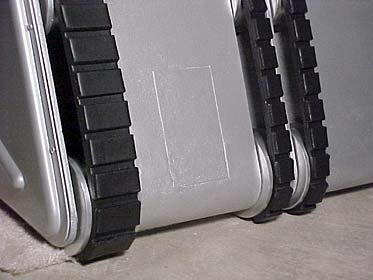 The number of finished treads you'll have will depend on whether you want yours to wrap around all the wheels front-to-back, or wrap separately around just the front and rear wheels. For the base of each tread, stick two lengths together back to back to achieve a 1/4" thickness. Take care to keep the edges flush to avoid unsightly seams. For the tread teeth, stick some additional lengths together front to back. 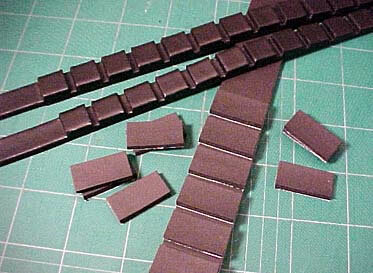 Cut these into 1" lengths and attach them to the tread base, leaving a 1/4" gap. You'll need about 12 teeth to show on each wheel. To seal the pores on the edges of the foam tape, use a paintable latex calk. You can apply this either with a brush or your finger. It'll take several coats on all edges to achieve a smooth finish. This can be applied either before or after attaching the teeth. Finally, spray on a coat or two of Plasti-Dip flexible rubber coating. This product dries flat and gives the foam a uniform look. Once they're installed on your wheels, they'll look very much like real treads. Total cost: under $25.